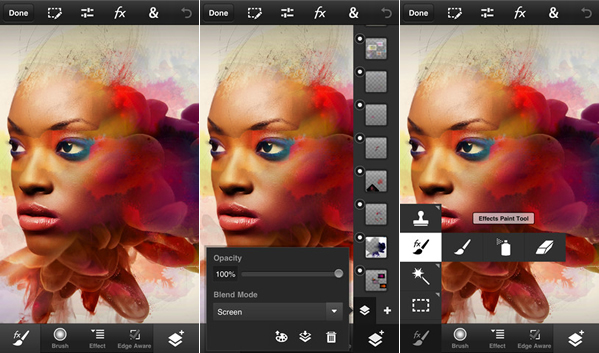 Adobe has released the Photoshop Touch for smartphones that mimics the functionality found in the tablet version. Moreover it also allows you to sync your work through your army of devices with a free Creative Cloud account, so that you can work on Android or iPhone, tablet or on your desktop PC. Till now Photoshop touch is available to tablet but smartphones are limited to Photoshop Express, with this release users of both iPhone and Android can have Photoshop touch for a price of $4.99. It shares identical set of features with the tablet app. It has core Photoshop features like layers, advanced selection tools, adjustments and filters. Scribble selection for high-precision selections using your fingers, camera fill for blending camera feed with layers. It also features Color Drops and Acrylic paint and a new Ripple filter like the tablet version. With the free Creative Cloud account you can keep your work in Sync and finish the project you started on phone, tablet or desktop. Free membership to Creative Cloud will give you 2GB of free cloud storage. Photoshop Touch for Android requires Android 4.0 and up, and it needs iPhone 4s with iOS 6.0, it also supports 5th gen iPod touch.